Home Tags Posts tagged with "Sindh"
The low rainfall trend in the last five years in Pakistan has resulted in drought conditions in most of southern Pakistan, where the Pakistan Metrological Department expects a further escalation of the drought condition in the following four years. The low or no rainfall has resulted in acute shortages of water, food and livestock fodder which has further damaged the food security, nutrition, livelihoods and health conditions of the local communities of the affected areas. The Government of Pakistan estimates an approximate of five million people (three million in Sindh and two million in Baluchistan) being affected by the drought in twenty-six districts of its Sindh and Baluchistan provinces. Both Sindh and Baluchistan provinces have high rates of poverty and food insecurity. The incidence of multidimensional poverty is forty-three per cent in Sindh and seventy-one per cent in Baluchistan. While the incidence is even higher in rural areas; with seventy-six per cent in Sindh and eighty-five per cent in Baluchistan. Access to health facilities in these areas is extremely difficult due to the long distances, with the nearest health facilities located at an average distance of 19.8 km in Sindh and 30 km in Baluchistan. The high costs of travelling to these health facilities, the poor road infrastructure and a lack of cheaper public transport facilities acts as additional barriers to health services here. Even at the nearest health facilities, there is an acute shortage of lifesaving medicines and a general lack of essential medical equipment. Most rural population of Sindh and Baluchistan live in poor socioeconomic conditions . Their sole source of income in most cases is agriculture. Therefore, the shortage of water and scarce rainfull leaves these communities in further depreviation; with no livelihood and dying livestock. To meet their most basic household and survival expenses, seventy-three percent of these drought affected communities have taken loans from relatives, shopkeepers and landlords in the last six months and are living in debt. 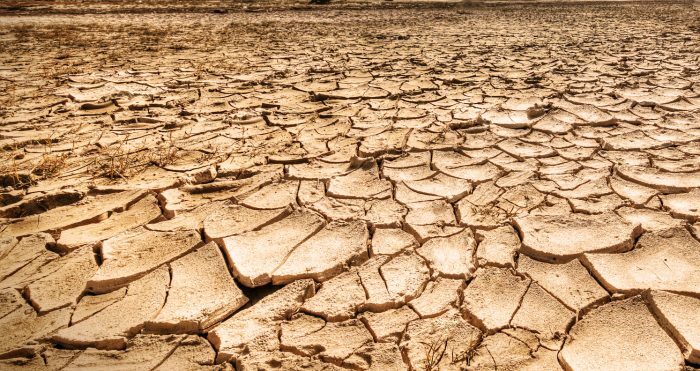 The National Disaster Management Agency (NDMA) and the Provincial Disaster Management Agency (PDMA) have been appointed with coordinating response efforts to support the drought affected communities at the national level and provincial level. While the UNOCHA is supporting these government bodies with its coordination mechanisms. Other UN agencies, international and national NGOs who plan to provide assistance to the drought affected communities have been asked to coordinate with NDMA and PDMA for response plans. The Provincial Disaster Management Authority (PDMA) of Sindh has distributed 50kgs (a two time distribution for two months) of wheat to drought affected families in the province. 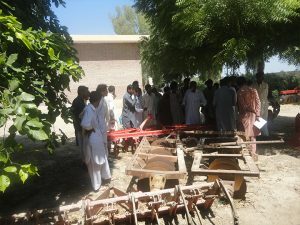 Additionally, three rounds of monthly distribution of ration bags to pregnant and lactating women in districts Umerkot and Tharparkar was completed on March 10th .According to UNOCHA, around twenty-six national and international organisations are currently working in Sindh province, while twenty organisations are working in Baluchistan province. Some of these organizations are working on drought response while the rest engaged in regular development interventions. According to the latest reports by the metrological department, the current rainfall rate has given some relief to the drought situation in some previously affected districts of Baluchistan and Sindh provinces. 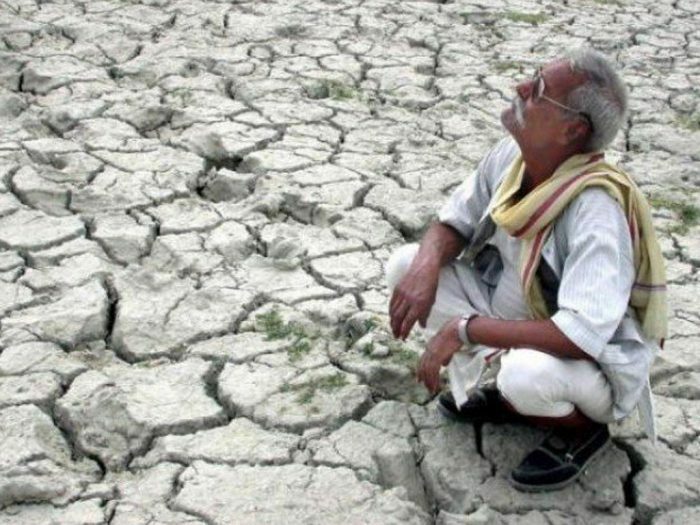 However, other districts, namely Awaran, Chaghi, Kharan, Noshki and Gawadar in Baluchistan, while Dadu, Khairpur, Mitiari, Qambar Shahdadkot, Sajawal, Sanghar, Thatta, Tharparkar and Umerkot districts in Sindh province are likely to remain under moderate drought conditions. Community World Service Asia is currently responding to the food security and health needs of the drought affected communities in district Umerkot of Sindh. Under the food security component of our emergency response, we have completed distribution of food packages to two-hundred and eighty drought affected families through a voucher scheme. In addition, a response project supporting five-hundred and fifty-five pregnant and lactating women and providing food vouchers to sixteen-hundred families is underway and expected to be completed in the following six months. Under the health component of our emergency response, we are providing emergency health services to 15,600 drought affected people through two mobile health units as well distributing baby kits and T-shirts for children. Nonetheless, there is still a massive gap between the actual needs of the drought-affected communtiies and the assistance provided to them so far. Many affected communities have still remained unattended due to limited funding and resources. More funding is needed to provide basic assistance to the communities that remain unsupported. Since droughts are slow, onset disasters, its response requires more planning and resource mobilization. There is therefore a dire need to organize resources for long term interventions to address drought mitigation and resilience building of affected communities. The first round of this distribution started in December 2018. Think Equal, Build smart and Innovate for change this Women’s Day! I raise up my voice – not so I can shout but so that those without a voice can be heard. We cannot succeed when half of us are held back. Women’s Day is an international event that celebrates women’s achievements and calls for global gender equality. It has been observed since the early 1900s and is now recognized each year on March 8th. The theme for this year’s Women’s Day, Think equal, build smart, innovate for change, focuses on inventive ways to promote gender equality and empower women, in areas of social protection systems, access to public services and sustainable infrastructure. To achieve the Sustainable Development Goal 5 on Gender Equality, it is first essential to understand the barriers that women and girls face on the way to progress and change and what support can be provided to them to overcome these challenges. This will be followed by designing and implementing deliberate steps to ensure that no woman or girl is left behind in the flight to success and progress. On this Women’s Day in Pakistan, we are celebrating the extraordinary work and effort of some ordinary, yet special, women who are leaving their footprints of change, innovation and development in the area of gender equality. Nimra, dropping her elder sister to the academy. 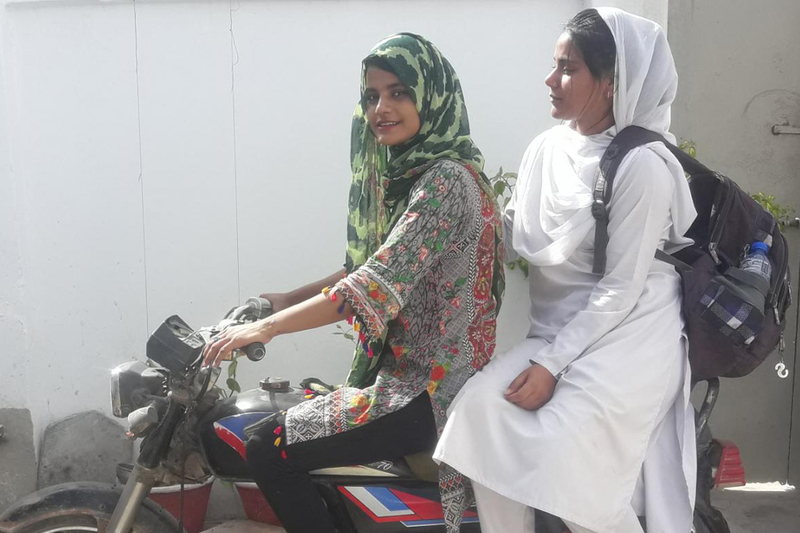 Nimra Shaikh, a BBA student at the University of Sindh, is changing the mobility trends of women in Mirpurkhas district in Sindh Province. The area I reside in is very conservative. If women are provided with education, it is considered more than enough for them. However, my father has been my source of encouragement towards letting me live my life to the fullest. His main priority for me was not only getting me educated but ensuring that I participate in extra-curricular activities as well. I ride a motorbike and now I am learning to drive a car. I wish to join The Pakistan Air Force one day. In the near future, I will be appearing in the initial test for Pakistan Air Force. When other girls in my university see me riding a bike, they approach me and ask me to teach them how to ride it too. I also drop my elder sister to her academy sometimes as well. In addition, whenever my father needs a drop somewhere I am always up and ready for it. Women can progress and shine in any field they desire if they are given equal opportunities. Moreover, the prominent role of family members in support of their daughters, sisters, wives encourage oneself to achieve the impossible. I hope to one day make my country proud. 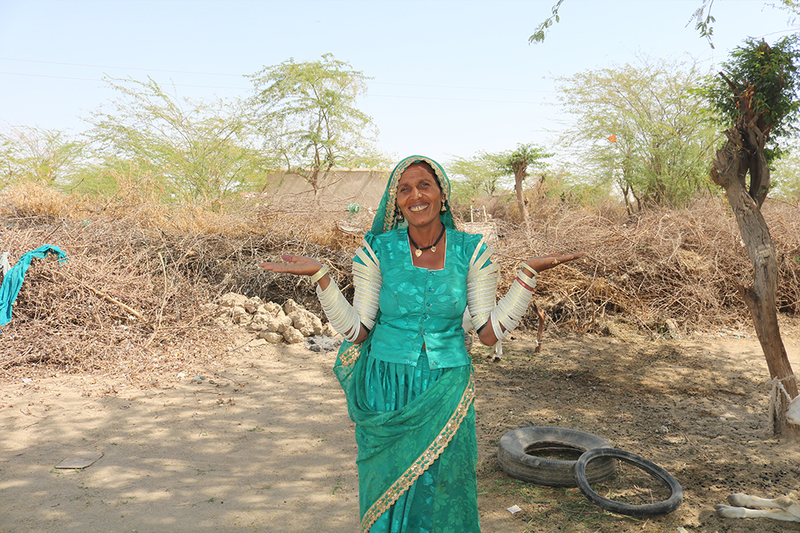 Sajida is motivating many women in remote villages to step up and spread awareness. 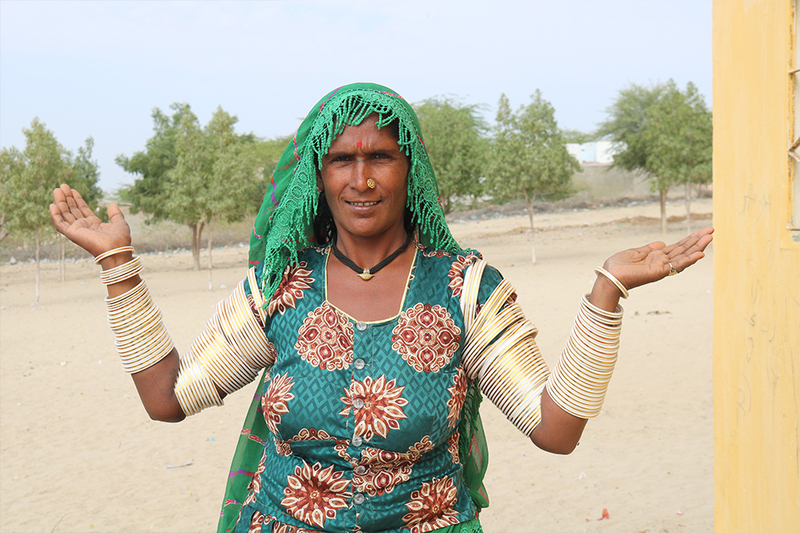 Sajida, a 41-year-old member of the Health Committee in Ranta village, has been an active participant of trainings and capacity enhancement exercises in the area. 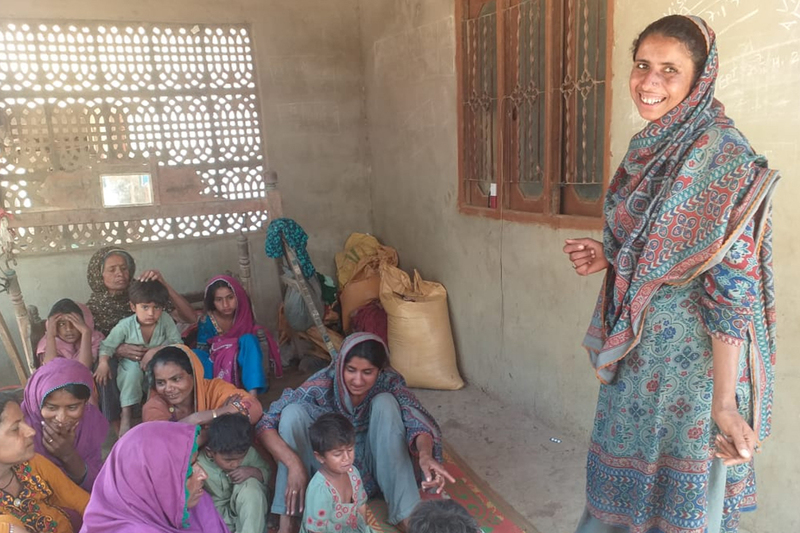 With a below average literacy rate in most remote villages of Thatta, Sajida has taken it upon herself to conduct health sessions in the local language for the women of Ranta. She raises awareness among women on basic health rights and practices so that these rural women can lead to fulfilling and healthier lives. Sajida’s enthusiasm to learn, teach and lead led her to become the Community Resource Person of Ranta for a Cash Assistance project, implemented by another national non-governmental organization. A group formed by villagers who provide sessions on health education. 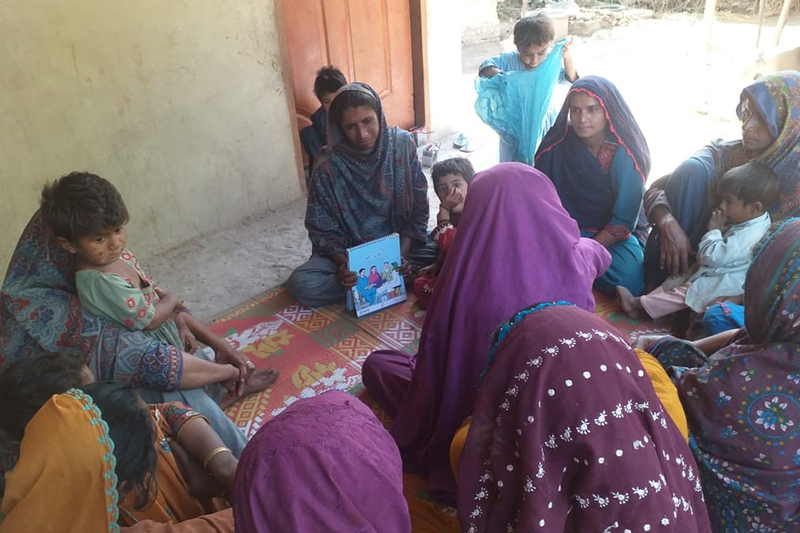 Sajida conducting a health session for the women in her village. “The future is exciting. Let’s build a gender-balanced world.” #Balanceforbetter is the official campaign slogan for this year’s International Women’s Day. So our partners, community members and staff put their hands out and STRIKE THE #BalanceforBetter POSE to make International Women’s Day THEIR day – and are doing what they can to truly make a positive difference for women everywhere. A resident of Haji Chanesar village in Umerkot, Hurmi is the Vice President of the village Steering Committee and a community leader since 2015. When I started working as a community leader, I realized that the people in these rural communities are still living with an ultra-conservative mindset, where living by caste systems was a firm way of life. Our community group convinced a family of a 16-year-old girl of delaying her marriage for three years. We were able to do that after many discussions and informational meetings with the family as they were quite rigid with their decision and thought there was nothing wrong with a girl marrying at that age. Hurmi delivers countless awareness-raising sessions that promote girls’ education and discourage early and child marriages. Women easily discuss their problems with us. I am happy when I help others to live a better life, especially when daughters are treated well. Now that we have been given a chance to live a better life, we must walk forward together to build a progressive society instead of letting each other down. I wish to see a society where all girls are educated and there is equality in every field. 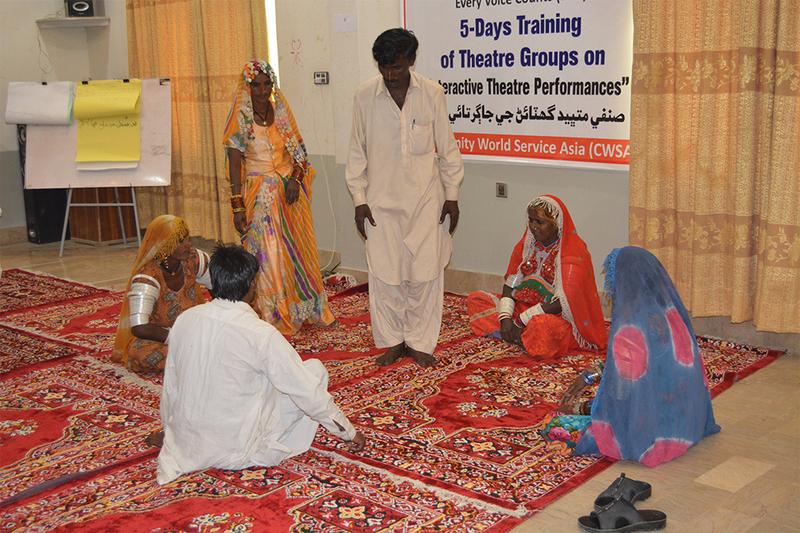 A recent launch of the Sphere Handbook 2018 through a theater performance in Umerkot motivated Saleemat, a 40-year-old resident of Mandhal Thakur village, to form a theater group, consisting of both men and women for awareness raising and learning sessions. The villagers were very surprised to hear my idea. I encouraged the villagers in a different way. I told them that we have limited access to movies and dramas. We remember the learning from the Sphere Handbook theater performance as it was educative and entertaining at the same time so we could use a similar platform. Through these plays, we can sensitize rural communities on various topics and issues that they are unaware of and can also become a source of entertainment and enjoyment for the people of our village. This will help in supporting the rural communities to progress and bring a positive change in their mindsets. Today, our theater group has ten members, including four women and six men. We will be performing 22 plays in 14 remote villages of Umerkot to sensitize people on the disadvantages and consequences of early and child marriages, benefit of girls’ education and on the importance of women’s role in decision-making. Saleemat also plans to promote the Sphere Handbook 2018 edition in each of her plays. The people residing in remote communities will be aware of some guidelines derived from the Sphere Handbook 2018 that guides the CSOs to use the minimum standards to protect the rights of all groups of society and ensuring their inclusiveness and protection. Moreover, they will know how their needs can be catered to, especially of women, children and most importantly of the differently abled members in the community who are otherwise ignored. The Mandhal Thakur Theater group engaged in a training for theater groups. Currently our theatre group is called, Mandhal Thakur Theatre Group, but we are thinking of a more creative name now. Marwan was living a quiet life in Haji Chanesar village in Umerkot. One day in early 2016, my husband encouraged me to join a vocational centre set up under a livelihoods project of Community World Service Asia. Though I joined the centre reluctantly, my experience there changed my life. I learnt more than I could ever imagine and in return of my dedication and hard work, I was selected as the Quality Assurance Supervisor at the centre. As an artisan, I created vibrant apparel products and home accessories and started to support my family through my earnings. Today, I am proudly working as a professional trainer for a provincial organization at a local vocational centre in Umerkot. I earn PKR 15,000 monthly (Approx. USD 107) and am supporting my husband in contributing for my children’s education and household expenses. Marwan never thought she would be working as a professional and independent woman. On this special day for women, I want to call out to all women in the rural communities (such as mine) to come out and work for yourself, support your family and contribute in the progress of the society. Do not be afraid, we are in this together. There are many other women like Nimra, Sajida, Hurmi, Saleemat and Marwan, who are stepping up and working their way towards innovating for change. Today is a global celebration of women’s achievements and a call to action to accelerate gender parity around the world. Let us together celebrate every act, big or small, of women’s courage and determination! expressed a twenty-three years old, Zeena unhappily. The family of four, the family’s only source of income is her husband’s daily wage of approximately PKR 150 (USD 1.5). With this menial income, meeting everyday needs become very difficult for the family. Two years ago, when Zeena was expecting her second daughter, she heard of a Maternal Neonatal Child Healthcare (MNCH) center established in Ranta village from her neighbors. Upon finding out that the MNCH center is located near her village, Zeena’s husband allowed her to visit the MNCH on her own for a check-up. After my first visit to the MNCH, I started visiting the center regularly through my nine months of pregnancy as prescribed by the lady doctor there. The doctor’s fees at the MNCH was minimal, thus very affordable for villagers like ourselves, who earn less and have no savings. added Zeena who, along with her husband, was also given health and hygiene sessions at the MNCH for her to start developing a healthy diet during pregnancy and after. My hemoglobin was low therefore the lady doctor advised me to eat food which contains iron including fish, green vegetables and beans. My husband made sure I took a healthy diet as prescribed by the lady doctor as this time he was more aware. Zeena adopted healthy and hygienic nutritional practices at home which improved the health of her baby and her during pregnancy. After her daughter’s birth, Zeena visited the MNCH for antenatal care regularly, which helped the doctor to treat and prevent potential health problems throughout the course of her pregnancy. It also aided in promoting healthy lifestyles in the village, benefiting both mothers and children. After a smooth nine-month pregnancy, Zeena gave birth to a healthy daughter at the MNCH center without any complications as she had strictly followed the diet chart and took all her prescribed medicines on time. Zeena’s husband and mother-in-law were very pleased with the services and efforts of the staff at the MNCH. Zeena has regularly been attending the MNCH for postnatal care. She was given a session on breast feeding by the midwives at the MNCH. Zeena was also advised on breast-feeding her newborn for six months and gradually to start feeding her small meals as per diet plan then after. 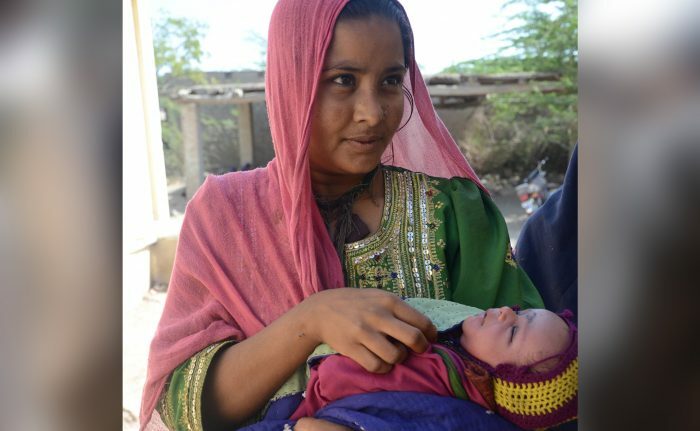 The effectiveness and sustainability of the MNCH is empowering rural women and communities in many villages of Thatta. Moreover, the center is facilitating in addressing the health needs of the community and in raising awareness on health issues and rights of women and children. 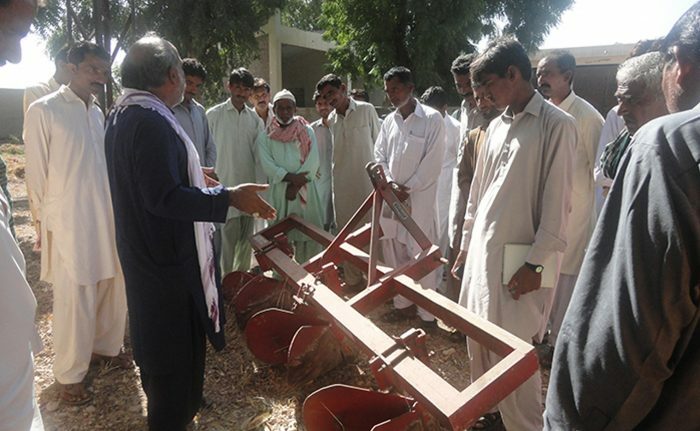 Yousif Channa briefing the participants about implements placed in Agriculture Training Institute (ATI). Briefing at Agriculture Training Institute (ATI) Sakrand about Local Drip Irrigation Technology. Farmers at WRI Sakrand witnessing different implements used in soil management. 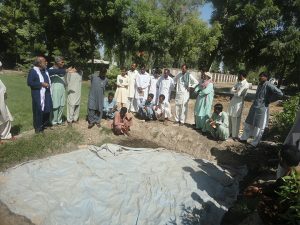 Yousif Channa in Agriculture Training Institute (ATI) Sakrand briefing farmers about compost making. An exposure visit of fifty-five rural farmers from different villages in Badin, Sindh, to the Wheat Research Institute (WTI) in Sakrand, Central Cotton Research Institute (CCRI), Agriculture Training Institute (ATI) and the Seed processing unit of Sindh Seed Cooperation took place in September. This visit was conducted as part of building the capacity of rural farmers on adopting sustainable agricultural practices, under the CFGB supported, Sustainable Farming and Food Security project implemented in Sindh, Pakistan. Through this project, together with the participation of the farming communities, we are promoting the production of food, fiber, and other produce using farming techniques that aim to protect the environment, public health, communities, animal welfare as well providing long-term development and food security among the communities. Most of these Sindhi communities are most affected by climatic hazards and the adverse impact of climate change. Muhammad Yousif Channa, Senior Instructor at ATI and Coordinator of Integrated Pest Management (IPM) Unit, Sakrand facilitated this farmers’ exposure visit. The work and development of high yielding new wheat varieties of WTI were shared with the farmers and the two new wheat categories, of early and late sowing, released by WTI, were introduced to them. The farmers then visited the Wheat Museum where different varieties of wheat were on display. The different types of machinery in use to implement the diverse practices used for wheat crop management were shown to the farmers. This learning was essential to the rural farmers’ knowledge as they could see it’s practical implementation, enabling them to easily apply it in their own farming to ensure successful integration of sustainable agricultural practices in their villages. Ashraf Soomro, Director at the WTI, Sakrand, engaged the farmers in an interactive discussion to identify and address the issues they face in crop management. While responding to questions about water shortage Ashraf Soomro recommended sowing wheat on Ridge, which was also demonstrated to them, as it would save 30% to 40% of the water. He also shared with them hand bills and a booklet on wheat production technology. At the CRRI, the farmers watched a presentation on the institute itself, the many cotton varieties it has developed and most importantly on cotton pesticides and the damages it does. The Senior Scientific Officer at the institute, then went on to talk about insects that are beneficial to crop growth and how those can be managed. During these presentations, it was learnt that development of different cotton takes 10-12 years. The Plant Physiologist at CCRI delivered an in- depth presentation on crop production technology, focusing on soil analysis and fertility management, for the farmers. He emphasized on the importance of soil analysis, without which it would be impossible to identify if the soil is enriched with nutrients or not. After the CCRI, the farmers’ visited the Seed Processing Unit of the Sindh Seed Corporation. The focal person at the Unit, shared and demonstrated the process of adulteration, the removal of broken and shriveled seeds, and the process of seed grading, to ensure the production of the best seed quality. As the last stop of the exposure visit, the farmers were introduced to the Agriculture Training Institute (ATI) and to different methods of adopting sustainable agriculture practices. The Senior Instructor at the ATI demonstrated different and cost effective methods of farming. These included compost making, plantation with pitcher irrigation, drip irrigation by using water material, propagation via air layering and organic gardening, all carried out at the ATI. Ashraf Memon, Instructor and Veterinary Doctor at ATI, not only shared better livestock management practices but also responded to queries and prescribed medicines and indigenous techniques to control the various diseases. The farmers were very appreciative of this exposure and learning opportunity. Not only did they learn various crop management techniques first hand but would also take back the learnings to share among their farming communities. For them it was much appreciated the visit as they learned different techniques of cop management which will be useful for them to implement in their field of work. Since our forefathers’ time, we used to sow either by placing the seed or a vegetative part of the plant in the soil. The technique of Air Layering, i.e. to make new plants from the branch which is in the air, was very new and we couldn’t ever imagine that we could produce a new plant this way. This exposure visit has taught us innovative techniques of farming which can be beneficial for us. Ghulam Mustafa Kaloi, farmer from Babar Kaloi village, Badin. It was the first time for me to ever visit such specialized institutions. Visiting the Cotton Research Institution was a great opportunity for us to witness and learn how to develop new cotton varieties and manage pests through an integrated approach. Muhammad Zaman Lalial, Ghulam Hussain Lalial village, Badin. We waste many thing which, if processed properly, can be very productive for the land. One of the example is the dispose off the medical infusion drips after utilization however we have learnt that that wasted drip can further be used for drip irrigation where there is scarcity of water. This was a new learning for me at the Agriculture Training Institute Sakrand. Water scarcity is a serious issue in our village and we cannot afford expensive irrigation Drip and Sprinkler irrigation systems due to our weak financial status. I learnt the simple and no-cost DRIP irrigation technique by using the waste material at the ATI and I applied that technique at home for kitchen gardening. I am very thankful for being given this exposure visit as it has taught me a lot. Ahmed Khan, Muhammad Sheedi village, Badin. 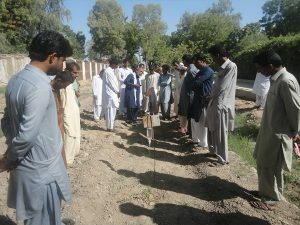 Kitchen gardening activities conducted under the Sustainable Farming project in Badin aim to improve food security and household nutrition for disaster affected communities. 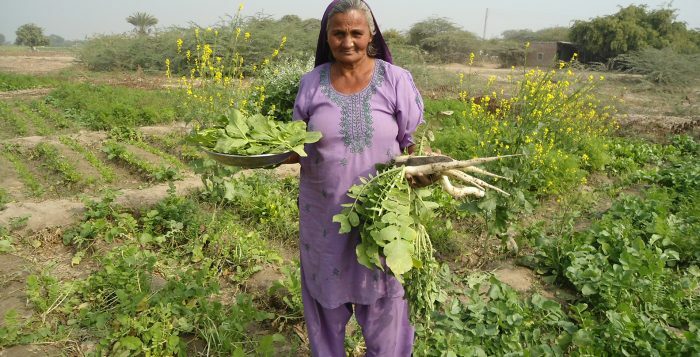 Mirzadi, wife of Photo Khan and mother of eight children, belonging to Abdul Karim Leghari village in Badin, is one of the most active participants of the kitchen gardening trainings in Badin. Six of Mirzadi’s children are married while she lives with two of her unmarried sons, who work for daily wages as labourers and sharecroppers in the area, supporting their mother and their very old and unwell father. The family does not own any land and relies solely on the income of the two young boys. Mirzadi had no experience or expertise of growing vegetables before the kitchen gardening training. Earlier, she purchased vegetables for cooking from the local markets. This was expensive for her as she had to travel a distance to reach the markets and then buy the vegetables at whatever rates were offered. Considering the menial income of her sons, this was difficult to afford very often. At the kitchen gardening trainings, Mirzadi learnt basic gardening skills and the knowledge to grow her own vegetables in her own little garden. Mirzadi found the “nutrition session” most interesting as it highlighted the importance of providing her family with nutritious food by consuming fresh and chemical free vegetables. Upon the completion of the training, Mirzadi prepared a patch of land near her house to sow the seeds she received after the training. Soon after the seeds cultivated, producing fresh nutritious vegetables, Mirzadi observed a substantial decrease in her household, especially kitchen, expenses. This saving allowed her to keep the money for other domestic matters and healthcare needs. Mirzadi is successfully growing spinach, carrots, radish, garlic, coriander and tomatoes in her garden.